Aosta has been called the “Rome of the Alps” because of its rich historical legacy. 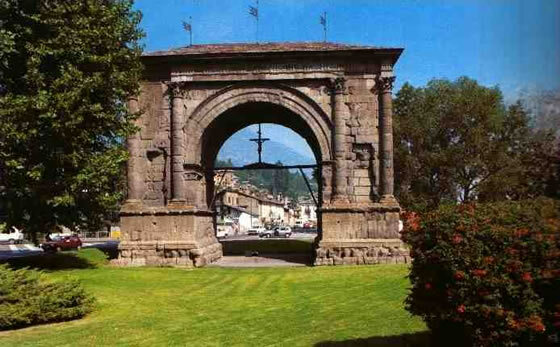 It is especially known for its Roman remains, including the Arch of Augustus. The main sights of historical and artistic interest in the town are in Piazza Chanoux, around the Cathedral and outside the walls, where you will find the collegiate Church of St. Ursus, a fine complex with origins in Roman times, dominated by a Romanesque bell-tower erected in 1131. The Buthier River is spanned by an ancient Roman bridge with a single arch. The citadel at Bard is one of the best examples of fortified complexes dating from the 19th century. 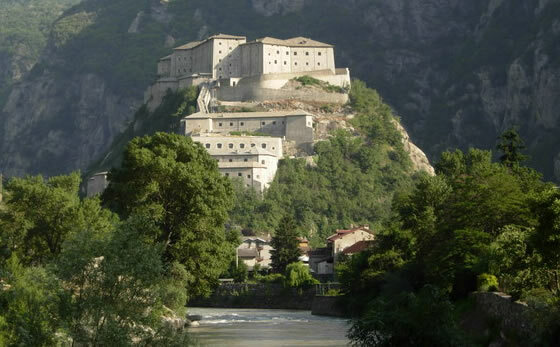 The historic site passed down from the local lords of Bard to the House of Savoy, who improved and strengthened the defences. In 1827, Carlo Felice began the reconstruction of the fort, and this new stronghold was formed of three groups of buildings at different levels: the Opera Ferdinando at the bottom, the Opera Vittorio in the middle and the Opera Carlo Alberto at the top. The Opera Carlo Alberto also housed the prisons, with 24 cramped, narrow cells for holding prisoners. Nowadays, the Fort contains exhibition spaces covering 3,600 square metres.